​In 2008, when our Pilgrim Reception Centre was in its first few months, a pilgrim came to us with an idea. 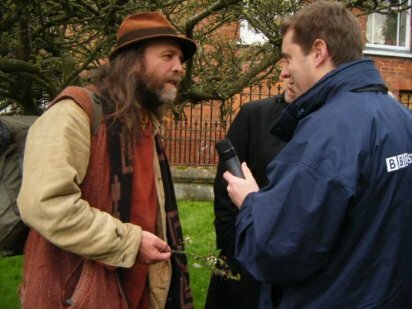 Adam Stout, a lively and engaging Historian and Author and an erudite, creative, 21st century eccentric, had bravely decided to walk across time, in the footsteps of the equally eccentric 18th century elderly John Jackson, of Yorkshire. 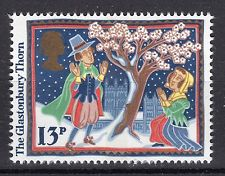 Jackson, had learned of the legendary Glastonbury Thorn which flowered twice a year, once at Easter and once again on Christmas Day whilst the fruits of the earlier blossoming were still on the tree. After the passing of the Calendar Act, whereby eleven days were to dropped from the month of September 1752, set off to walk 220 miles 'through the mud and mire' to observe this 'miraculous' tree; his focus to see if it would adhere to Parliament and bloom on Christmas Day New Style, or stick to its principles and blossom on Christmas Day Old Style. Adam writes, "This is the story of a cussed old codger who walked the length of the land one winter in search of a legend, and of another who followed in his footsteps". Having 'fetched up' with a PhD in archaeology, Adam admits he is not much of a digger; "my interest is in story-telling, and in the many strange tales that get told about the past. Some are licensed by authority, though it’s the more unusual and outlandish takes that intrigue me most." Adam's epic journey nearly didn't happen. He writes, "I was getting demoralised, and was on the point of giving up when I got a warm and enthusiastic vote of confidence from Morgana West of the newly-founded Pilgrim Reception Centre in Glastonbury. She adopted me as a kind of mascot, sung up my mission to all and sundry, and put a framed photograph on a side-table in the shop, making me feel like a well-loved relative. Knowing that someone who I’d never met before wanted me to do this trip made all the difference. It’s the power of belief. Much easier to believe in yourself when others do so too." 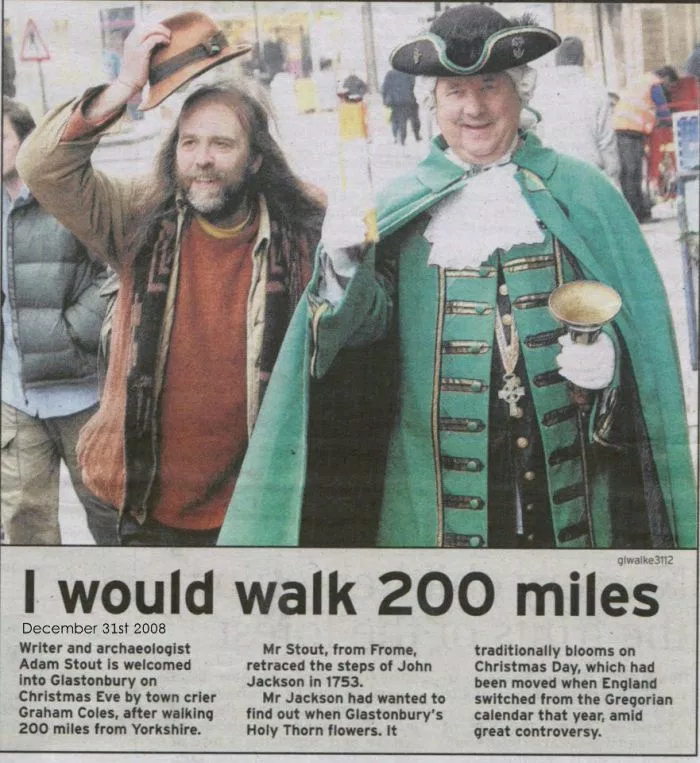 Extensively researching the journey and after digging though archives, Adam set off from Woodkirk in Yorkshire and followed almost the same route, avoiding the major roads, and arrived in Glastonbury on Christmas Eve 2008. He was received by a warm community welcome, arranged by the Pilgrim Reception Centre. 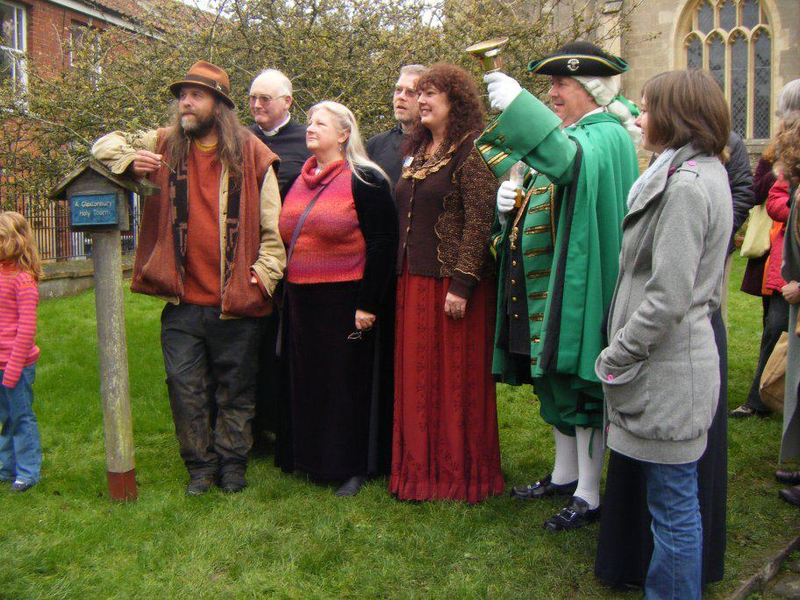 ​The late Graham Coles, our Town Crier, escorted him to St John's where he was met and welcomed by Morgana West, Manager at Glastonbury Pilgrim Reception Centre, the Vicar of Glastonbury, The Reverend David MacGeoch, members of the Glastonbury community and the media. Adam nearly missed the blossoming of the flower and was presented with the last bloom on the tree by Reverend MacGeoch. A carol, created for the occasion was written and performed by the beautiful and talented Emily Portman. At the end of 2015, Adam completed the write-up of his epic trek. He weaves a poetic narrative with insightful commentary on an English landscape and its people, both past and present. Filled with intriguing historical references and an infectious depth of soul and humour, a reader is soon falling into step beside him and sharing every stage of the journey. Read Adam's intriguing account of his journey here. 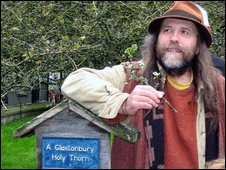 . .
Are you undertaking a special pilgrimage to Glastonbury and would appreciate a welcome from the Pilgrim Reception Centre? ​Contact us with your story and let us know how we can help you.